Bollywood is all set to witness another wedding -- this time, it is Vivek Oberoi's turn. The actor will tie the knot with Bangalore girl Priyanka Alva today. 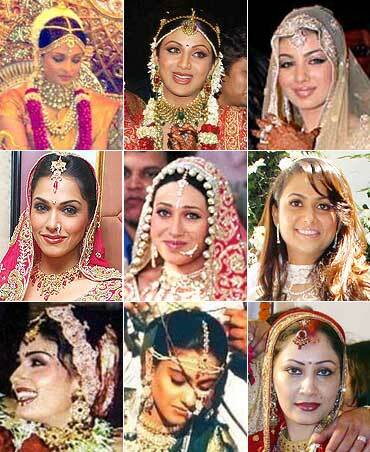 While we wait to catch a glimpse of his blushing bride Priyanka Alva, here's a look at some of Bollywood's pretty women on their wedding day. Click through the pictures and vote for the prettiest bride at the end of the slide show. When you are one of the world's most beautiful women, looking good on your wedding day is a piece of cake. Ash, clad in a beautiful gold sari and tons of kundan-themed jewellery, was a sight to behold. Raj Kundra must have thanked his lucky stars when Shilpa agreed to be his better half. Shilpa painted a pretty picture in a traditional red lehenga, created by the celebrity designer Tarun Tahiliani. The sight of Ayesha Takia in a shimmering gold-silver outfit adorned with glittering diamonds, more than made up for the years restaurateur Farhan Azmi had to wait for his bride to say yes. Isha Koppikar look pretty in a pink lengha designed by Neeta Lulla, as she exchanged vows with restaurateur Timmy Narang. Traditional red took a backseat to a rose pink lehenga designed by Manish Malhotra. Karisma looked so radiant that she even outshone the elaborate diamond necklace adorning her neck. We know the bride is the cynosure of all eyes at a wedding. But in Amrita's case, she stole the show three times! Her wedding with industrialist Shakeel Ladakh was a three-day festival with several functions like sangeet, a church wedding and nikaah lined-up. But our favourite is her in this white Ashley Rebello gown. Ajay Devgn's bride made a pretty picture in a typical green Maharashtrian nine-yard sari with a studded nath (nose-ring) to go. Raveena and distributor Anil Thadani decided to go all out for their wedding day. Opulent festivities aside, the bride clad in her mom's reworked wedding sari, still managed to steal the show. 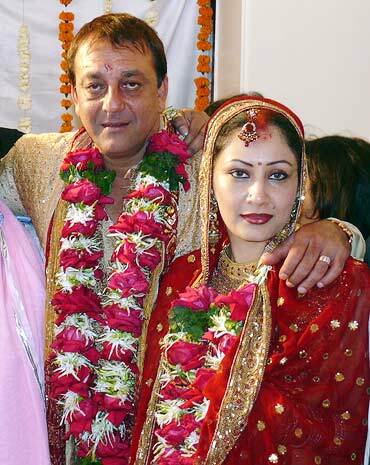 Mrs Sanjay Dutt looked the epitome of the shy bride clad in a gold sari with a red veil covering her head.